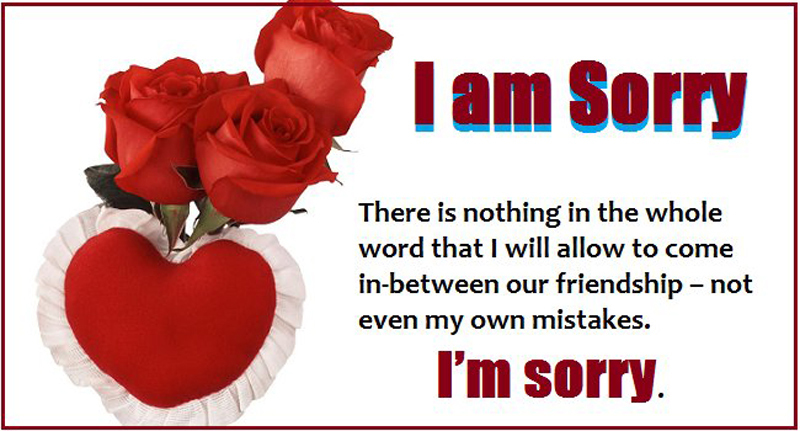 I Am Sorry Messages for Friends : Words To Say I’m Sorry Dear Friend. Friendship is a relationship where fights and arguments start from silliest things or reasons and fights and misunderstanding is also a part of friendship. It doesn’t a big matter cause those love more also hurt more and obviously they are bestie. So, don’t be late to set your misconception if you have with your friend and you should take the first step. 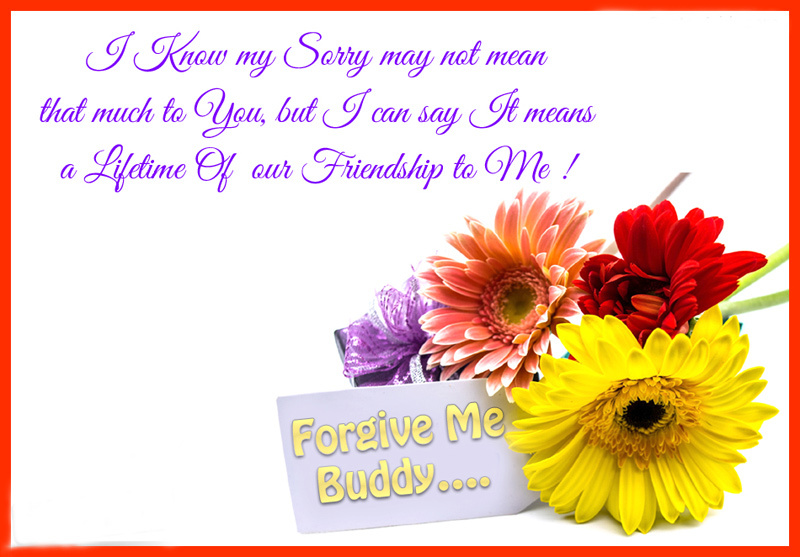 Here we badge some best lines as sorry messages for friends by which you can repair your misconception with your bestie. When your own words don’t feel like enough to say sorry then these sorry messages will support you to confess or apology for your wrongdoing. 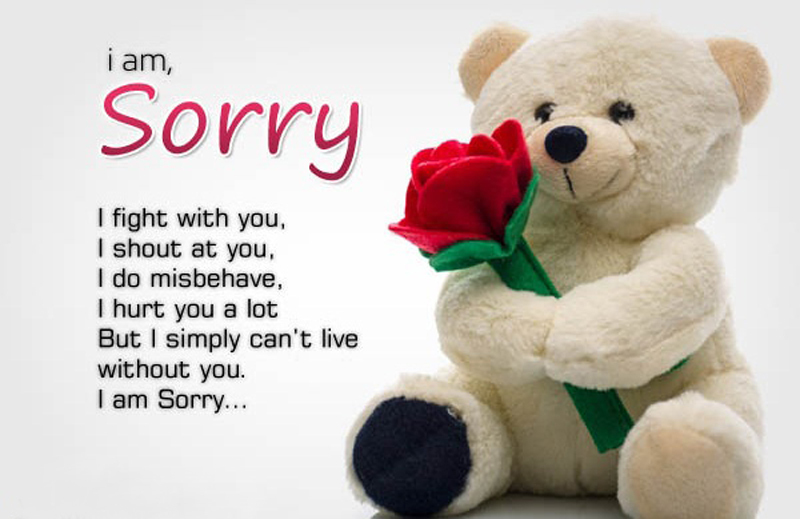 These sorry messages for friends are too effective and easily shareable on the cell or any kind of social apps like Facebook, Whatsapp, Twitter etc. The biggest failure in life is when you break the heart of a close friend. I will never be able to express how I feel inside. I am really sorry about everything! I have done many mistakes in life but none of them came back to haunt me with such strength. I am deeply sorry for the pain I have caused you. Please forgive me. It’s been so many sleepless nights for me for quite a long time. I am burdened with my own stupidity. I feel no shame in admitting my faults. I am sorry dear! I may not be as wise as you but I am wise enough to see the damage I have caused to our friendship. 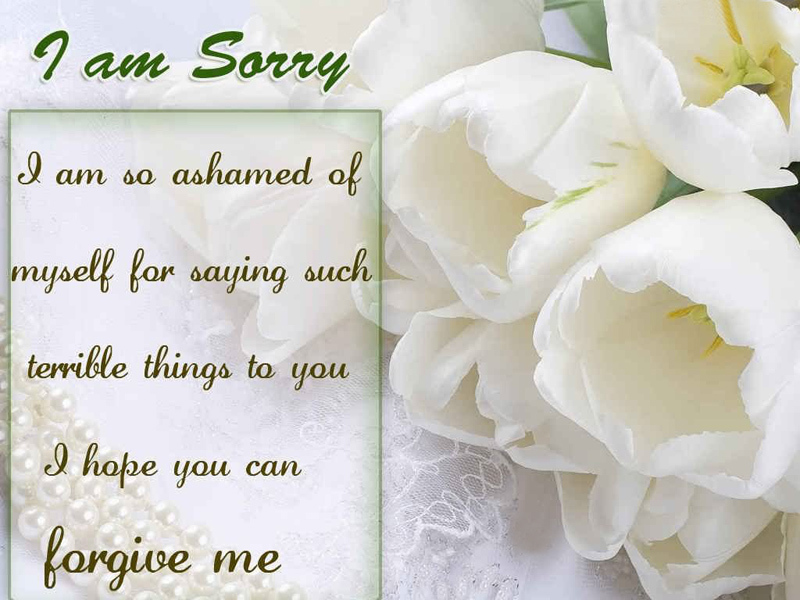 I know you will forgive me in the end but I am really sorry! I wish I could take back all the pain from you & fill the space with the joys of friendship once again. I don’t know how much I can do with a simple SORRY. But I know you will understand! In life, friendship is being tested. I lied to you because I love you. I need to protect you. Sorry if I lied my friend. My mistake was an accident but our friendship isn’t. My apology is full of regret but our friendship isn’t. I am not sorry for fighting with you. But I am sorry that I fought with you for the wrong reasons. Please forgive me bro…! Sorry for being such a brat the other day and thank you for being such a wonderful friend by hugging me even when I was wrong. Sometimes I take the liberty to take you for granted because deep down in my heart I know that my best friend will always understand. I am sorry. I wouldn’t allow anything in this whole world to come between our friendship. Not even my own mistakes. I am sorry for what I did. Our friendship has no rules but it is based on two beautiful things – unlimited love and unlimited forgiveness. 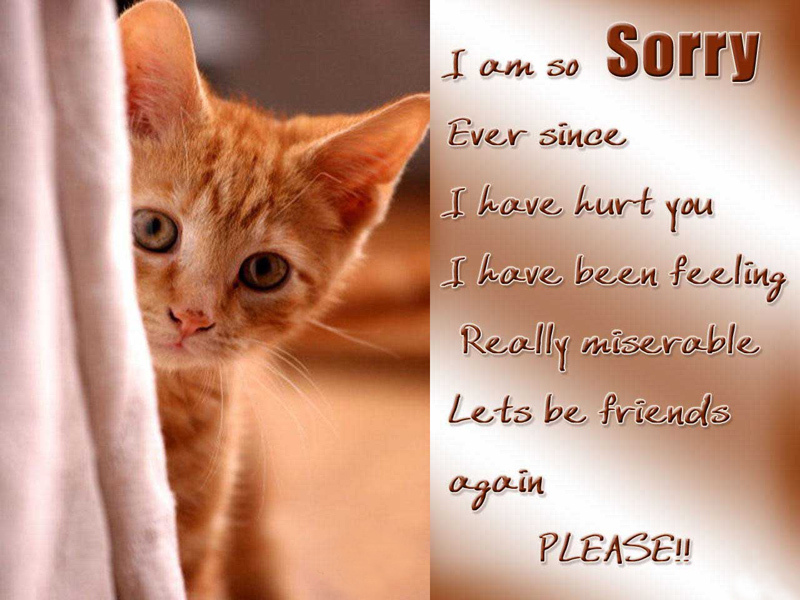 I am sorry for annoying you, please forgive me. Ever since I have hurt you I have been feeling really miserable, let’s chill and be cool again! I’m sorry please forgive me! Life does give a second chance to everyone. But, I am saying sorry to you right at my first chance because I can’t wait any longer to see a smile on that face again. You are the sweetest person I have ever known. How can I possibly remain normal after hurting you? So I am saying sorry to you now. Will you forgive me? If you add a little bit of salt in too much sugar, it still remains sweet. Our friendship is just like that. 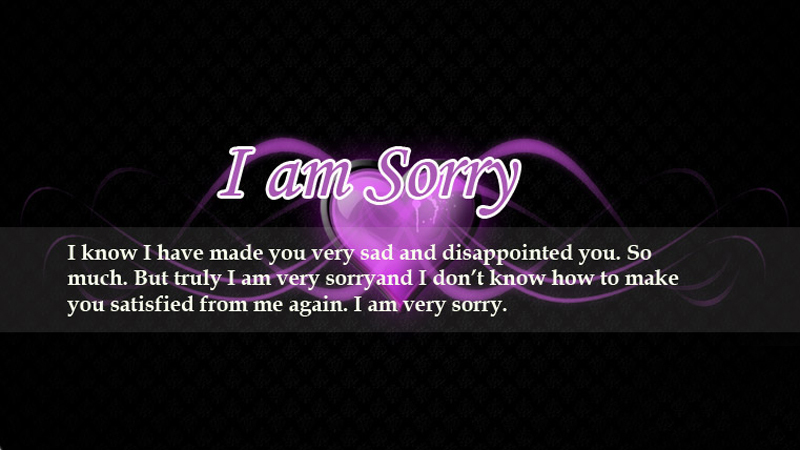 I may have done some silly mistakes but I don’t hesitate to say that I am sorry! My world is all dark & dull when you don’t have the smile in your face. I know it is because of me that you are so upset. I have sorry dear friend. Please smile now! I haven’t found any better friend in my life than you. Every moment with you is like a moment spent in heaven. I feel truly sad because I have hurt someone so special to me. I am sorry! Our friendship is too valuable to me to end over this. To find another friend like you would be impossible, you’re caring, patient, funny… I can go on and on and it doesn’t feel right without you anymore. Our friendship is lifelong. My silly mistake is just a little pothole along this beautiful journey. I am sorry. Life has its own way of making you realize the value of friendship… and the worst part is that it’s always in hindsight. I miss you, my friend, I’m sorry for not keeping in touch. I will never lie to you again, I will never cause you any more pain. From now on I will be extremely cautious because our friendship is too precious. Please forgive me. I feel bad that I hurt you. You were my true friend. I owe you an apology and I think this is the right time to say it. I’m so sorry for all the lies. So sorry my friend. Just like how you spotted my lie by simply looking into my eyes, I am sure you will spot the regret in my heart just by hearing my voice. I am sorry. I don’t care whether you forgive me or not. You will forever be the friend who I love a lot. I’m sorry. I won’t say a word. The sweetest apologies are never said, they are felt. I am just going to let you look at the tears in my eyes until your heart melts. I am sorry. If I knew my actions would hurt my best friend I would think thousand times before doing that. You matter to me more than you think. I am sorry! I don’t reasons to say sorry to you. I can say sorry when I am guilty, I can say sorry even when I am not. Because our friendship means so much to me. I look in the mirror & I see a person who is devastated by his own mistakes. A person who is crushed by his guilt. A person who desperately wants to be forgiven by his dearest one. A person that says SORRY. Life has been way too unforgiving for me. I know I make mistakes but you have always been kind to forgive me again & again. I am sorry to you for one last time. I could have sent you a thousand words note saying how guilty I feel for hurting you. But life is short. So, I decided to say SORRY & resume our friendship right now. Because I don’t want good times to be wasted anymore. I am not SURE how many people would tolerate my mood swings but I am SURE that you would. I am sorry for being such a jerk the other day. It’s very easy to say sorry but I know it’s very difficult to be the bigger person and say that it’s okay. Please forgive me, I am sorry. I know saying sorry is just not enough for how much I hurt you but I’ll say it a million times until you forgive me. I am sorry. My friend, I didn’t mean to upset you. I lied because I have to in order to save our friendship. I hope you understand. I wish to see you to explain everything to you. Sorry is the only word I got here. But my tears means the whole world. Sorry my dear friend! I am sorry for lying. You can be as mad at me as you want. But do it quickly because I’ve got something really exciting to tell you. Friends like you are one’s lifetime achievements. You have always been an amazing friend to me. I am deeply sorry for my mistake. Please accept my apology! You are a true gentleman & a great friend. It’s my fault to not realize the result of my actions. I am deeply ashamed for that. A true friend like you deserves an unconditional apology. I am sorry! I never had a second thought before sending this message to you. As soon as I realized my mistake, I decided to apologize to you without any delay. I am sorry after all! I never let EGO come in between our friendship. In fact, when I am wrong, I am ready to apologize. Right now, I really feel I am guilty. So, I apologize for my mistakes dear friend. I know you are sad & upset. All I can say is that I did not want to hurt you in any circumstances. Because of all the things in life I care about most is our friendship. I am sorry for everything! As one of life’s delightful treats, friendship is best served innocent. Thanks for keeping it that way and sorry for being a jerk. I’m honestly heartbroken things are like this, I don’t want my mistake to ruin our friendship and it would mean so much to me if you could give me a second chance. The best way to say sorry to friends is to look them in the eye and bare your heart. If they really care for you, they’ll understand. That’s exactly what I’m doing now. I’m sorry for all the lies. It hurts you and I understand if you cannot forgive me yet. But please always remember that I only did it because I care for you. I’m sorry. I am sorry I lied, I am sorry you cried. I didn’t mean to be rude, please forgive me dude. People like you come along once in a lifetime and I would never do anything intentionally to jeopardize our friendship. Thanks for being such a good friend, I am sorry. Our friendship is too precious and I would never want to lose you, by doing something irrational. I am sorry my words hurt you, but I want you to know that it wasn’t intentional. 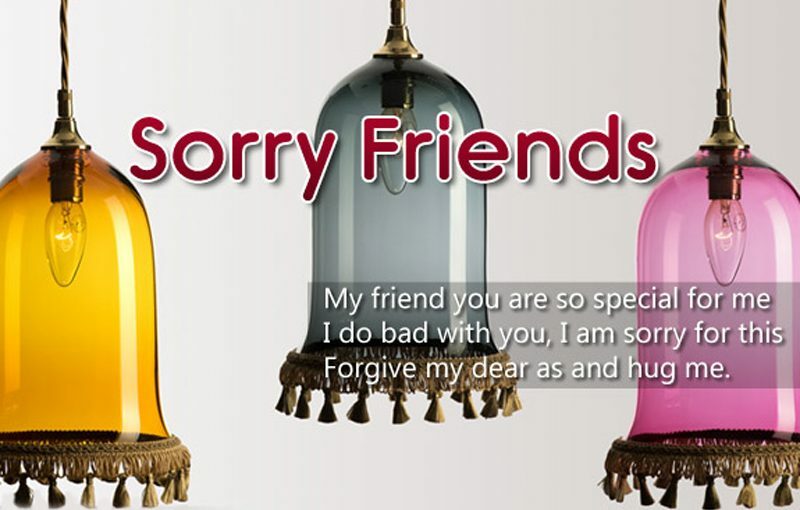 Hope that you are prepared to say sorry your friend and may our compilation of sorry messages for friends will give full support to repair your misleading conditions of best friendship. Our heartfelt well wishes to long live your friendship. Thank you for staying with us.